Receiving criticism, negative feedback, getting rubbed the wrong way by somebody is absolutely part of life. Most of us don’t like to be criticized. How’s that for an understatement? But criticism really is almost unavoidable. The only way you can live a life without criticism ever happening to you is to hide away in a cave, never see another human being or talk to anyone, just stay all by yourself all the time. That’s the only way that you’re never going to receive negativity or negative feedback from someone else. Criticism can tell us how another person perceives us personally or our team. The difficulty is, this feedback is quite often tinged with the other person’s emotional state. It’s really hard for us to see ourselves and be 100% honest about how we’re doing. So feedback can be helpful. A comprehensive guide to dealing with stress, anxiety and the pressures of life. You don’t know if your work and your communications are having their intended impact. The only way you know that is by getting feedback from the outside world. Feedback can help you understand how you look from an outside perspective. The difficulty is, this input from others is oftentimes like a distorted mirror. It shows us to ourselves from another’s perspective. Unlike a good mirror, oftentimes this negativity, this criticism, this poor feedback that we get gives an inaccurate picture. The negative feedback can be distorted. One of the things central to the distortion that happens is the other person’s mood. There are times that the criticism or negativity you receive has much more to do with the other person’s emotional state than anything about you at all. They are in a mood, and you are the recipient of it. The feedback they give you may be a form of emotional expression and sometimes it contains a little bit of useful information. You need to see what you can get from his or her message. See if you can find the truth often hidden in the emotional statements. You might need to filter through the way it’s delivered, because the emotional tone or mood can make a major impact. If someone hits their thumb with a hammer, they may become very caustic. “Hurry up! Give me that! You’re too slow!” That mood that they exhibit may be detrimental to your relationship, and it may be hard to receive the value within the communication. Another reason for this negativity or criticism from others may be because of an unrealistic standard. There are people out there that expect you to be perfect. When you turn out to be merely human, they get distressed, they get angry, because they have expectations of what you’re supposed to be and you’re not living up to them. It very well may be that nobody could live up to these external standards or expectations of other people. These standards aren’t really all that helpful because they often create barriers which get in your way. Another thing that creates negativity may be when the other person is trying to control you or manipulate the situation. Sometimes the person giving you this negative feedback secretly wants to manage your behavior. They want you to do what they want you to do, because they think they have the answers. If you’re not doing exactly what they want, if you don’t behave how they like, they feel entitled to jump in, seize control, and try and get you to do what they want. This negative feedback from a control maneuver, this power grab, can get in the way. I overheard a man the other day say to someone else sitting in a luncheon meeting, “Bob, this place is terrible. You’re just lousy at picking places for us to go for our senior management meetings. From now on I’m going to do it.” It’s a control maneuver. Somebody’s trying to put it over on somebody else and it’s a way to grab power back by putting someone else down. These stress management tips are simple, cost effective methods to effectively check stress. Everyone feels stress. It’s a fact of life. Sometimes pressure can overtake you and make you feel completely out of control. 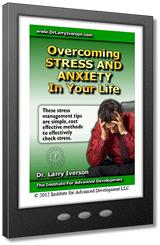 “Overcoming Stress and Anxiety” will give you over 20 ways to overcome this overwhelm. This 65 page eBook is a comprehensive guide to dealing with stress, anxiety and the pressures of life that keep you from being happy. Here’s the chance to beat stress and anxiety once and for all while gaining strategies for greater happiness and increased energy.